A great dictation app can make your daily professional dictation tasks easy to perform, cut down on time spent saving and transferring completed dictations for transcription, and eliminate the need for multiple dictating devices. Dictation Apps: What Are They? 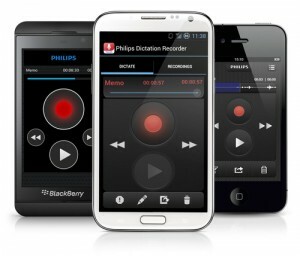 Dictation apps are apps designed to be used on SmartPhones and other mobile devices for professional dictation. Dictation apps for professionals are not to be confused with dictation apps for voice to text conversion, where you control the dictations and other applications using the spoken word. Dictation apps on SmartPhones are used by many doctors, lawyers and other professionals to carry out their day-to-day dictating within their work scope. The dictations are provided to an in-house transcriptionist, or a professional transcription company, for transcribing. Using a dictation app on your SmartPhone negates the need for traditional dictating devices. Because the files are easily transferred from the SmartPhone, regardless of your location (as long as you are connected to a WiFi network), you can dictate anytime and anywhere, meaning you are no longer tethered to your office. The use of Dictation apps also reduces document turnaround times. Dictation Apps: What Functions Should I Expect? 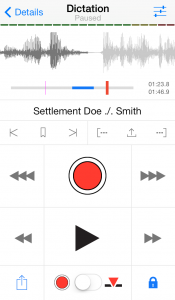 Dictation Apps: What Makes A GREAT Professional Dictation App? As well as having all of the functions listed above, a GREAT professional dictation app is one that is above all else – EASY TO USE. It has to be intuitive to use, easy to navigate and to populate duplicate data or select often used settings, because people using these apps for dictation are using them all the time. No one’s going to use an app that is difficult to navigate, or requires large volumes of data to be entered every time a new dictation is made. What’s more, a GREAT dictation app provides multiple methods of transferring data, which is also easy to set up and use, so that your daily workflow is not disrupted. I would also go so far as to say that a GREAT dictation app is one which pushes the boundaries of traditional dictation, encouraging us to embrace new ways of thinking about how we dictate, and what tools we can use to complement and enhance the dictating experience. Easy to use barcode scanning function for fast assignment. Try out some of these dictation apps for professional use, and tell us what you think about them and others you’ve tried – we’d love to get your feedback. For more information on dictation apps and other dictation and transcription products, please contact the Products Team at Pacific Transcription. If you would like your dictations transcribed by a professional transcription company, contact us!